Thanks to you, is a pleasure to participate in your podcast! First of all, I appreciate the invitation to your program and to be able to answer the questions about what we are doing with Rossino. I would love to know about your introduction to Roleplaying Games like Little Fears; what was the first RPG you played? Being honest I’m not much an RPG gamer, but the first time I got some interest in the media was with the game Warhammer 40k with the immersive world ,the bast myths and visual designs plus the great fandom, it was something I never experienced before. I've really never played a roleplay game, to be fair I can say many teenage friends played and I was there in home eating food from the fridge... I watched their immersion in these stories and always told to myself "someday I'll do it" and still that day never came hahaha... it's a debt, I know how the roleplay games work and it's something very exciting to watch. So Little Fears is a pretty hard to find RPG where I’m from; how did you come across it? 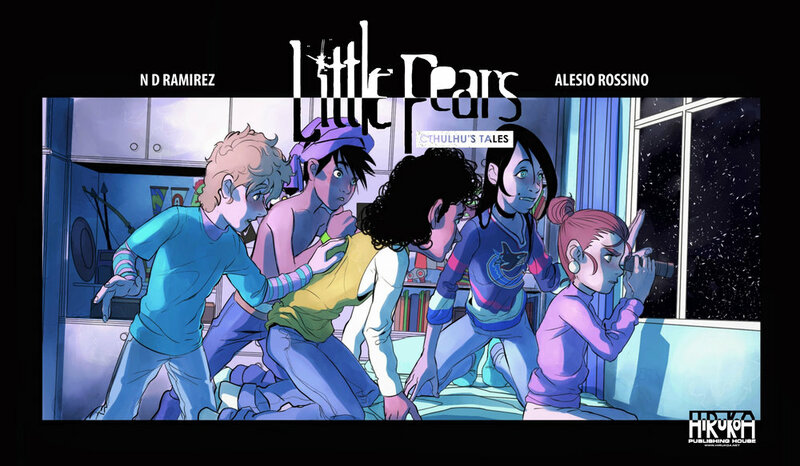 My first encounter with little fears was for this project, more exactly when Nicolas told me that Hirukoa publishing house wanted to offer us the possibility to work with the franchise. After that I started to search more about the game and came across a really dark and twisted world with really deep visions at the moment to make the player feel the avatar in the game, fears was everything but little in the game. I got to the point to buy and read all the books related to the game and create a character just for fun that later became a main character in Little Fears - Cthulhu Tales. Thanks to Javier, my editor, everything was thanks to him. When I presented the story that we thought of making with Ale, he answered that he liked it but he had a better offer to work together. He asked me if I liked Lovecraft (who doesn't like it?) and that the protagonists were children, he saw the potential in Ale in the illustrations and showed me what it was little fears, I researched by myself and saw how giant the game was, it was a cult game. I saw it was a difficult game to find too and that liked me even more, everything looked like a big challenge. When I talked to Ale it happened the same to him, we fell in love with the story and possibility they gave to us to narrate what we wanted to tell, with no doubt we found our place to tell a heavy tale with content (something that does not happen often) when I realized I was already thinking in the butterflies and the kingdom of Closetland. 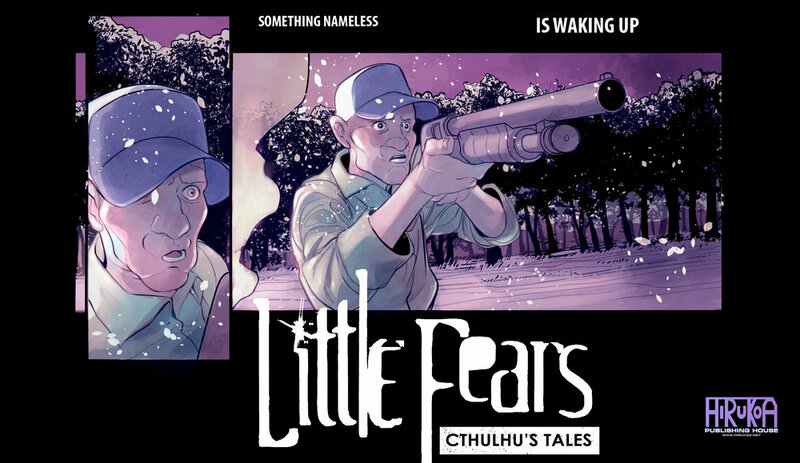 Right now you are designing a comic for based on this game called Little Fears: Cthulhu Tales - in the original Little Fears the main bad guy is the Boogeyman. Why did you choose to bring in Cthulhu as the central evil figure in your tale? It was a suggestion from the publishing house. At first I wasn’t sure about introducing such a famous character to the myths of little fears, but after knowing more about the game itself I found a way to make it and introduce him in a different way that fits more in the original game line. Is not the usual representation of Cthulhu and i really hope that people love the final result, is worth to mention that Cthulhu is not going to be the only Lovecraftian creature with great power to appear. If you search closely in the pages maybe you can figure it out who is going to be (hahaha) but I also would like to explore the figure of the boogeyman and more of the nature of Closetland in future instances of the series. Here comes Javi again, the editor, he told me he wanted Cthulhu as possible villain and we worked on a base so the story could fuse with "The color that fell from the sky" story (a Lovecraft's story I really love). It can be said the story it's more inclined to Cthulhu's side than the monsters from Closetland BUT (not much can be said) there is a lot of Little Fear's mythology as well as many Easter eggs from the saga. In general words, imagine Little Fears Cthulhu Tales like: there's a kid in a room, the door opens and an arm comes from it to take him (that's the Lovecraft's universe), but a the same time there is one coming from the closet trying to take him to Closetland. The story is that kid in the middle. Other than the inspiration taken from H. P. Lovecraft’s tale and Little Fears; would you say you have any other inspirations for the story you are going to tell? Personally I see R L STINE work as a big inspiration for the story at the moment to draw it, not in the style ( little fears is a lot darker) but more in the vibe and tone, 90s horror. Ryukishi07 is another big reference at the moment to create a great horror atmosphere, his way of developing the characters with good depth and well-defined personalities and his ability to make the place where everything happens another important character in the story, is a great example to follow. In this story's case, a big influence was a writer I personally love, who's called Cormac McCarthy. Maybe the story's focus is reflected mostly in his philosophy, it's not a kid's story, here we're talking about kids who must confront their deepest fears and these situations are going to make them grow and think like adults. Other inspiration source it's my 7 years old son, he became a reflex of some things kids do (although in the ones from the story are a little older) and that helped me to make the story more real. I take many personal experiences too, maybe it happens that when you are an adult you realize how you thought and saw things around you, and that shows pretty much in the story. So both of you are working together to create this comic; is this a collaborative effort of storytelling or has one person written it while the other does the art? It is more a collaborative effort of storytelling. We took another point of view at the moment to work, we think it less like work and more like a game, that the story we would like to play and live. At some point both of us started telling ideas and letting the characters progress by themselves, and the final result was the story. 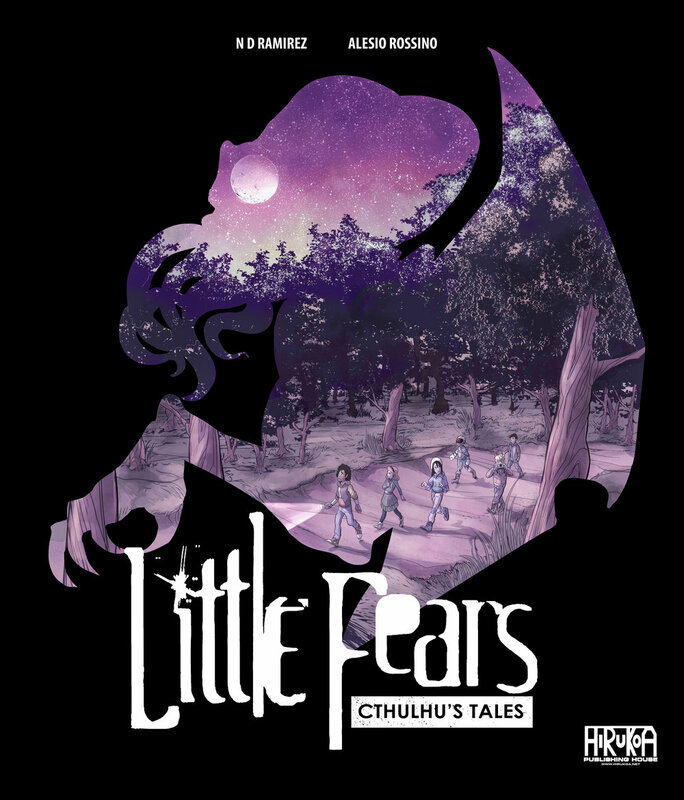 We feel the characters and world of little fears Cthulhu tales as a growing, living thing. What is your hope to achieve with this comic: will it see major global release, a release online, or perhaps only a national release? we are going for a global release, first is going to come online on Drivethrucomics and comixology and really soon we will be starting a Kickstarter campaign for the physical release in English and Spanish, the publishing house is also looking up to translate it to French and German. We are not only trying to offer something new to the old fanatics of little fears but also trying to introduce it to new players and for the first time to Latin America and Europe. I believe we are approaching for a world launching, the Kickstarter campaign will be launched soon and we are going at the 100 percent so everything comes out perfect. Our principal idea is that, from the first page, the story can feel "real", we want everything working so we can make a second arc of the story (which is already a draft) and is even more important that the people likes it and when I say people I mean the public who plays roleplay games, the one who read comics and that one person who doesn't know about any of those things mentioned before. What else would you like to say about your Little Fears comic project? To support us! Buy it many times (hahahahahahaha) support the editorial that will publish it, the HIRUKOA editorial. First it will be launched on web by Driverthrucomics and Comixology, then the printed version will be available. At first it will be in Spanish and English and maybe another language, we expect good sales. Last question, if our listeners wanted to follow you on social media or know more about your other works; where would you recommend them going such as a website or a social media site? The only thing I've edited and that you can obtain is a story called "Ojos del Abismo" (Eyes of the Abyss) that is on Comixology and drivethrucomics, after I published for Mexico on a magazine and in Uruguay in the Plan H magazine, then BlackBox of Asia, but these last things can be obtained, but I don't have the links at this moment. I’d definitely like to take the opportunity to promote Tunnels and Trolls, there's a crowdfunding campaign coming. Next it's the YouTube channel I administrate with my beloved wife, who works on it based on the comic store I have there in Rosario. Thanks to you for inviting us to participate, it was a lot of fun! Thank you very much for the invitation!! I hope everything comes out like everyone wants!